I’ve never really attempted a Thomas Keller recipe although my husband likes to from time to time. I’ve always been more of the slow cooking comfort food contributor in our house, recipe optional. I thought this week it would be fun to combine my love of comfort food with trying out my first Thomas Keller recipe. 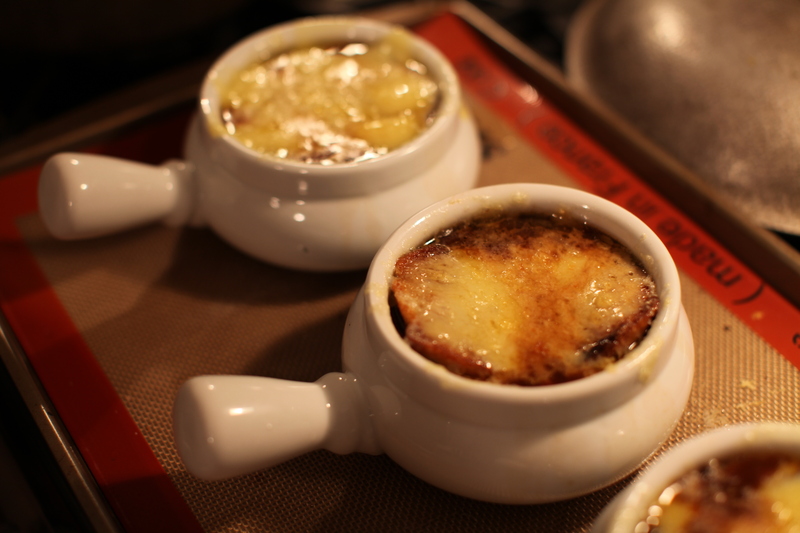 I decided to make one of my favorite comfort foods, french onion soup, for the first time from the Bouchon cookbook. I’ve generalized the recipe here. To cook like Thomas Keller you have to have a few traits: a tremendous love of food, a meticulous nature and lots of time and patience. 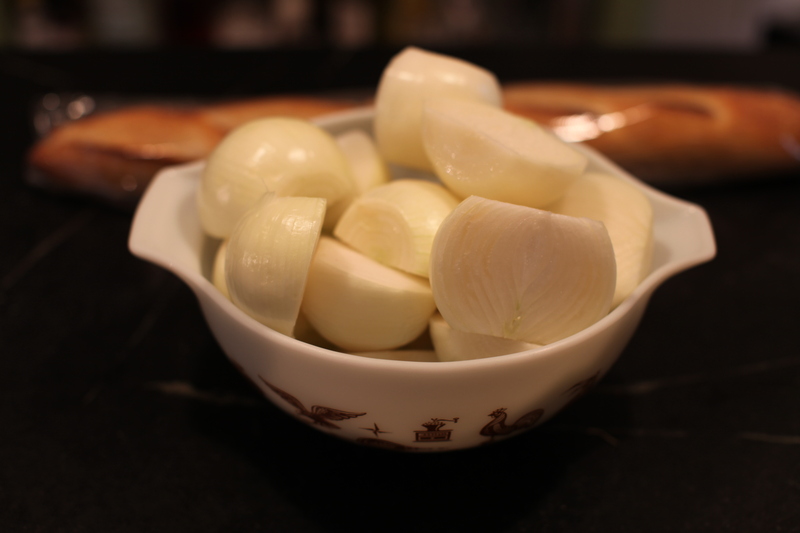 I am a little short on the meticulous nature but you can see above I did my best to cut 8 yellow onions into perfectly uniform 1/4″ onion slices without a mandolin. You’ve never cut an onion before until you learn to cut it the way Chef Keller does. It is an art. I also made my kitchen my office yesterday as in typical Keller fashion, these onion slices had to be stirred every 15 minutes for 5 hours! Yes 5 hours to perfectly carmelize the onions. It was a good break as I worked through a difficult freelance project I’m trying to finish. 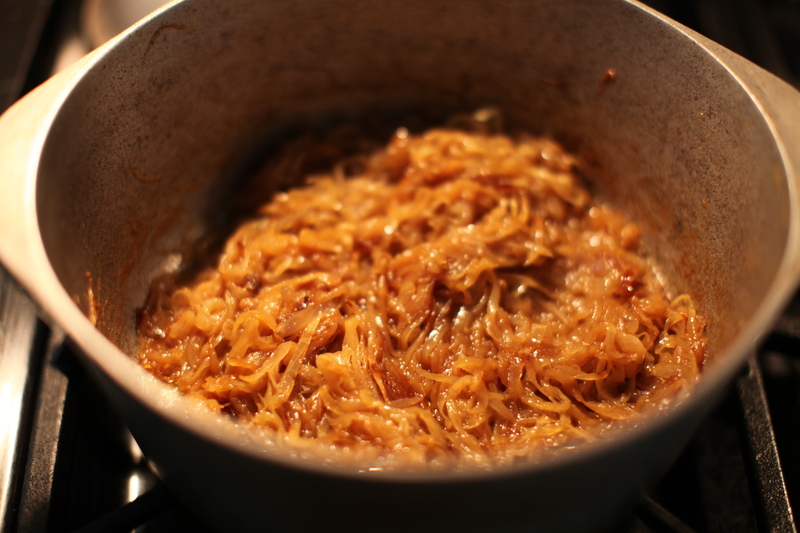 I have to say I’ve never tasted truly great carmelized onions until yesterday. It was worth the 5 hours and the intense smell of onion that took over the house, leaving a friend of mine who stopped by with the sniffles. The onions were delicious to snack on on their own and then I also made myself a little bite of baguette, peach basil preserves (from preserving week), pleasant ridge cheese and topped it off with the onions. 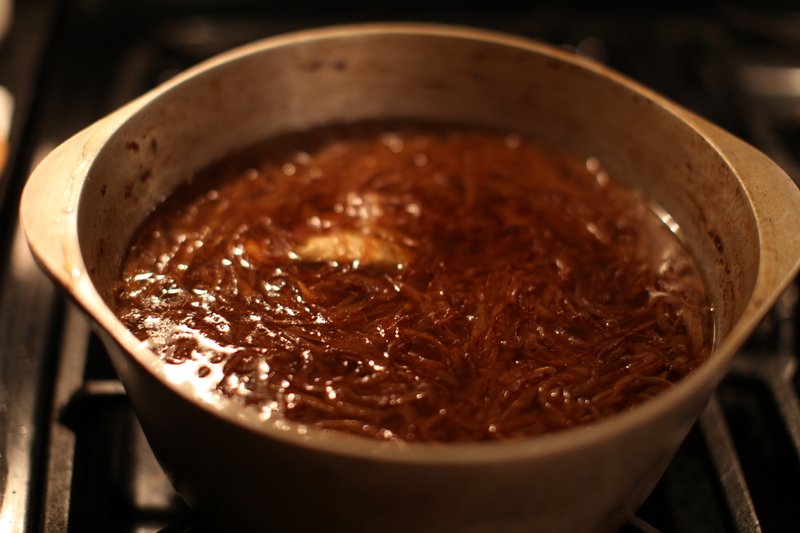 It was amazing and would be a great way to repurpose extra onions not needed for the soup. After the carmelizing was finished you add 3 1/2 quarts of liquid (half beef broth/half water) and a bouquet garni and then let it simmer for an hour. Another hour of cooking those onions! After an hour the broth had reduced nicely and I tried my first taste of the base of the soup. It was hands down the best french onion soup flavor I’ve ever had. I had to hold myself back from eating an entire pot of it. I let the pot sit off the heat until dinner time and then warmed it up again to prepare the rest of the soup. You make the croutons by simply slicing a baguette into 6 3/8″ (yes, 3/8″ to be exact) slices, brushing them with olive oil and broiling each side until golden. Then you combine all the great ingredients of the soup. 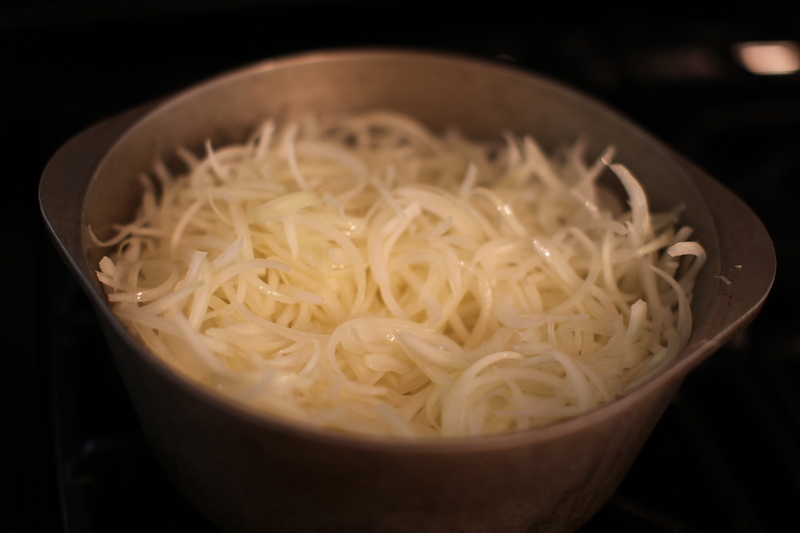 Pour the soup into a french onion bowl up to 1/2″ from the top. Lay the croutons on top and then top it off with a couple of slices of emmantaler cheese. I had to slice my own so they were not very perfect. You can then add additional grated cheese to the top to fill in potential holes. 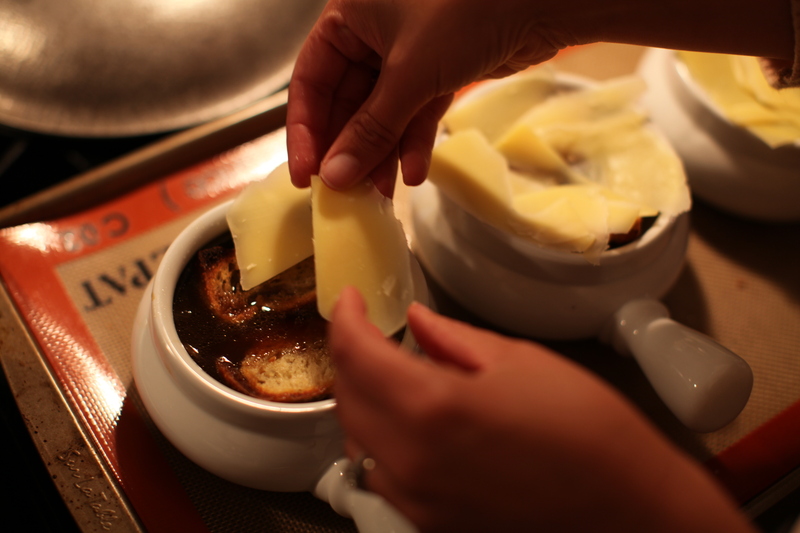 I love the gooey cheese in french onion soup and I would probably go heavy with it in the future. After only a couple minutes under the broiler the cheese had bubbled nicely. I think it’s important to get the slices because then it will stick to the sides vs falling into the pot like mine did, but it was delicious nonetheless! My friend Alicia joined us for dinner last night and it felt good to serve something that turned out so incredibly delicious. It’s an understatement to say this soup is made with love, but every bit of effort is worth it. I now have a new favorite comfort food in my repertoire and I’ve tackled my first Thomas Keller recipe. So delicious. You are a Thomas Keller pro! I am impressed, Darce! Looks amazing! You are currently reading Evoking Thomas Keller at 52 To Do.